Great post! It is interesting to watch translations work phrases, even when it would “seem” to violate a principle they try to hold to, but the right phrasing comes out as a result. I haven’t found another translation adding the “YOU.” It sounds so… so… egotistical! I’m wondering why they went that route! No translation is strictly literal. That’s impossible in going from one language to another. Besides, the KJV isn’t even the most literal of the literal translations is it? I think that honor belongs to the NASB. My question is this. What is the limit of interpretive license in translation? How can you tell when the text is being rewritten rather than translated? When I have looked up The Message it seems to be much more of a commentary than a translation. That’s an interesting verse. I’ve never noticed that. I think it would sound egotistical if Peter was saying it about himself! Ha ha! However, I think the NLT’s translation there is not as good as it could be because it seems that the focus is on “faith” and not “you” (as you’re saying). Heureth? seems to be referring to the previous piste?s, but I guess it wouldn’t be too crazy to see how the genitive pronoun (hym?n) may be the NLT’s determining reasoning. Good question. Next time I get a chance to talk to Grant Osborne, I’ll ask him… ha ha! I think we have to agree on the issue of meaning. For me, I think meaning is super important… in fact, more important than some who subscribe to the “formal equivalent” philosophy care to admit. That being said, I am cautious about going too far because there’s a certain place for *pause and don’t jump to conclusions here*… ambiguity. 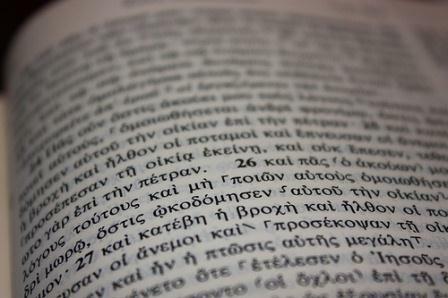 Some verses need to be left alone and translated as “hazy” as they appear in the Greek (or Hebrew). That being said, at least The Message will MAKE decisions whereas The Amplified just lets everyone join in the fun! One other thing, “essentially literal” doesn’t mean word-for-word at every turn. I think this is a wrong assumption. Is the NASB the most literal translation? It can’t be more literal than Young’s Literal Translation, can it? TC, I agree. Accurate is not the same as “literal.” If I gave that impression, I apologize because that was most certainly not my intention. The standard dictionary connects meaning to the word “literal,” which is often over looked by some. The only closest “literal” text we have is the Greek New Testament 🙂 (ha ha). When I’m doing exegetical studies, I still have BibleWorks display Young’s. It’s a bit dated (late 19th century) but there are some strengths with the translation. I’m not sure I’d say it is the “most literal” because it’s dated. The NASB tends to be as “formal equivalent” as one can be out of the majority of English translations. I just can’t see using it as a translation to preach from because it is not as readable (or preachable). I still enjoy the ESV as my primary and I constantly also recommend the NLT too. I also like the NET, mostly due to the textual notes, though the translation is nice too.